Thinking about resume writing as a whole can be a bit intimidating. It is a fairly involved and very important task. People don't usually go around bragging about themselves on a regular basis. To suddenly have to brag about yourself on paper feels quite unnatural to most people. This task is much easier if you think about it as a series of smaller, less complex chunks. 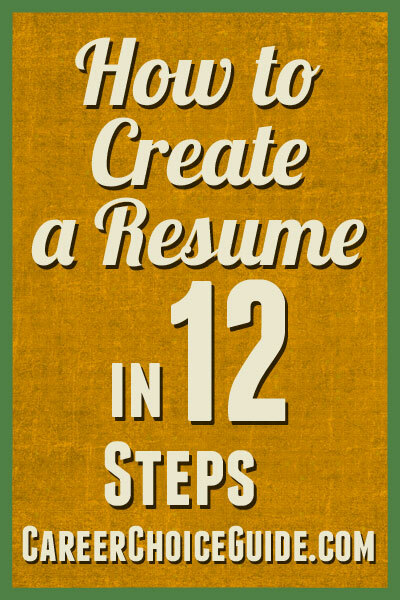 So, with that in mind, here's how to create a resume in 12 steps. Step 1 - Determine the type of job you are seeking. Most people skip this step and, as a result, create weak, unfocused resumes. You absolutely must know what type of job you are seeking before you begin to write your resume. When you know what type of job want to pursue, you can target your resume to that particular job. For each point you include on your resume, you can ask yourself whether it proves that you would be great at the job you are targeting and whether you've written the point in a way that is meaningful and compelling to an employer who needs to fill that type of job. Only when you know what type of job you want to pursue can you write a resume that drives home the idea that you are ideal for that job. That is what you must do to grab an employer's attention. Step 2 - Determine the type of resume that will best suit your needs. There are three commonly used resume styles - chronological, functional and combination. Each resume style highlights different aspects of your professional background, and, therefore, one style may be more appropriate than another based on your specific situation. Using the wrong format for your situation can really hurt your job search. In general, I never recommend using a functional resume because employers don't trust them. A chronological format can work well for someone with a solid career history, and a combination format works for almost anyone in any situation. Step 3 - Don't bother with formatting your resume right away. At this stage, most people start off by formatting their contact information in an attractive manner. Formatting before you've written out all of your information is a huge waste of time. Formatting involves making the resume sit nicely on the page in a balanced, appealing and easy to read fashion, and you won't truly know the best way to make your resume sit well on the page until you have finished the writing stage and you can see what you have to work with. Step 4 - Type out your contact information. The contact information section is fairly straightforward, but there are a few common pitfalls. No cutesy email addresses. Funny addresses are fine when you're contacting friends, but you must use a professional email address on your resume. Some combination of your first and last name is always safe. Ensure any phone number you include has a reliable voice mail system, and triple-check to ensure you have typed your phone number(s) and email address correctly. You might want to consider omitting your mailing address from your contact information if you would need to commute to the job you are pursuing. Some employers filter resumes based on location and prefer to hire someone who lives close by. On the other hand, some employers are bothered by resumes that do not include a mailing address. This option is not a straightforward choice, but if you are applying to jobs that would require commuting, and you have not had any response to your resumes, you may want to consider omitting your mailing address from future resumes when the job would involve a commute. Step 5 - Write your profile. Profiles provide a brief summary of the type of experience and expertise you can offer an employer. They help the employer to read your resume faster and more intelligently. Step 6 - Write your summary of skills. If you are writing a combination resume or a functional resume, the summary of skills comes next. If you are writing a combination resume, your summary of skills will typically include 5-8 of your most important selling features related to the job you are seeking. If you are writing a functional resume, your summary of skills will be much longer. If you are writing a chronological resume, you will not include a summary of skills. I have found that, for most people, the summary of skills is the most difficult section to write. In fact, I normally gather all of the other information from clients and then work on the summary of skills last. Feel free to skip this step, and come back to it at the end if you're feeling a bit stuck. Step 7 - Describe your employment history. For most people it's best to put employment history before the education section. Describe your work history in reverse chronological order (start with your most recent job first). Include your job title, the name of the company where you worked, the city and state where you worked, and your employment dates. Next, describe your job in bulleted point form. When writing this section, don't just think about what you did at your job, but also describe why you were good at your job. This section can be tricky to write well if you have any concerns with your work history such as a gap in employment, many jobs in a short period of time, or a career change. Chapter 9 of The Resume Writing Guide shows you how to structure your work history in a way that minimizes issues like these. If your education is a stronger selling feature than your experience, you may put this section before your work history. However, for most people, most of the time, education will come after experience. Include the name of the program, the school, city and state where you went to school, and the date when you completed the program, or the date when your degree, diploma, or certificate is expected if you are still working on completing the program. Step 9 - Describe your community involvement if appropriate. If your volunteer experience, hobbies or other community involvement says something positive about you as a potential employee, you may include this section on your resume. If this information does not add weight to the idea that you would be a great candidate for the job you are targeting, omit this section. Step 10 - Format your resume. Now is the time to format your resume. Avoid cramming too much information on a single page. Use bulleted points and plenty of white space so your resume is easy to read at a glance. If employers feel they will have to really work to extract the necessary information from your resume, they won't bother. At this stage, looking at a few examples can help you determine how to format your resume in a way that is easy to read. Step 11 - Proofread and edit your resume. In the spirit of full disclosure, I have to admit that proofreading is not my strongest skill. Normally, my wonderful administrative assistant would type clients' resumes; she was fabulous at proofing documents. When I did the typing, I always had a colleague check the resume for typos. That being said, resumes must be completely error free. If you step away from your resume writing for at least a few hours before you proof it, you'll see typos more clearly. Once you have reviewed your resume yourself, give it to someone else who a) writes well and has a strong knowledge of grammar rules, and b) will be honest with you if your resume needs some work. Step 12 - Revise your resume for each job you want to target. The more targeted your resume is to a specific job, the better impression you will make. Slightly revise your resume for each job (you may need to highlight different skills or focus on different aspects of your work experience) so that your resume reflects the idea that you would be an idea candidate for that specific job. You don't have to start from scratch and write a completely new resume each time, (unless you're applying to completely different, unrelated jobs) just make small changes to your existing resume. 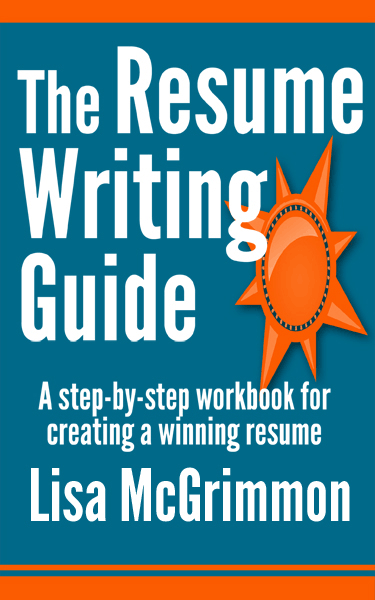 My book, The Resume Writing Guide, shows you exactly how to create a resume one step at a time. It expands on each of the steps above in comprehensive detail and provides you with a series of straightforward assignments that, together, allow you to prepare a winning resume. It is a thorough workbook that takes you through the process from blank page to winning resume. You can get your copy here.